Scared as he was, Hank dared to move out of the army despite the risk of execution upon being caught. He managed to get away from the war along with Tom Master, a fellow soldier who shared his desire to breakout. Along the way they found a sixteen-year-old girl whose family was killed by soldiers. The three planned to stay together as a family to survive and get to their destination safely. Then they stumbled upon a thespian troupe, which turn their lives around. The three of them became actors for over two years. They met people, one of whom was named John Windsor, who became responsible for their rise in society. Meanwhile, as Hank continues to make his way through life an unsuspecting tragedy seems to be following him. Will he still be able to find his peace, or will he succumb to the misfortunes that await his every turn? This book was displayed in LitFire Publishing’s booth during the 2018 Frankfurt Book Fair in Frankfurt, Germany, last October 10 to 14, 2018. 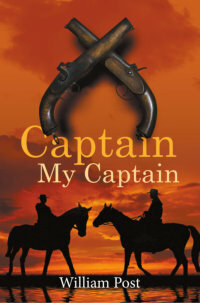 You can grab a copy of “Captain My Captain” at selected online bookstores. Book copies are available at LitFire Publishing, Amazon and other online book retailers. William Post is a retired professional civil engineer who was licensed in the state of California. He studied in Texas A&M and has served in the US Navy. Post took an early retirement and started his writing career. He is already a published author with 29 novels under his name.